Yesterday we filled you in on the Crew's catching prospects and today we move on to the next position on the diamond, first base. With Prince Fielder's future beyond the next couple of seasons in question, first base prospects will soon be some of the foremost in the organization. Clearly this isn't a position of strength in the organization, although it's better this year than it was just a season ago. 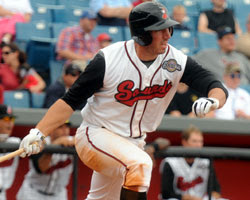 A year ago, Errecart might have been considered the top first baseman; but the switch-hitter has, thus far, been unable to make the transition from Class A to Double-A. Combine that with emergence of Halton and Kjeldgaard and he falls to fifth best. Halton is one to watch, he'd be ranked higher except he's only played one season of pro ball. 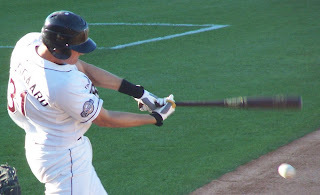 It was a good year though, in 69 games between rookie league and Helena he hit .345 with 45 RBI's. How he progresses over the next couple seasons will give a very good indication of how good he can be. Next up is the former pitcher, Brock Kjeldgaard. He has big time power and extra base potential, the big lefty had 54 extra base hits in 2009. Along with that he struck out 172 times, but the transition to position player continues. It was very close for No. 1 and No. 2 but in the end Koshansky gets the top spot. Still, Steffan Wilson had a solid year with Class A this season. Koshansky put up outstanding numbers when he was playing in the very hitter friendly park in Colorado Springs, but when he was claimed off waivers by the Crew, those numbers fell back down to earth (he hit just .218 with 23 less extra base hits). For lack of a better option, it's likely he'll get another year with Nashville. Wilson on the other hand, followed up his 19 home run 2008 campaign with 13 in '09. They say the Florida State League is tough on hitters, so his numbers there are alright. If he can continues to progress he may project as a Lyle Overbay type of first baseman but with a lower average. First base is not a strength for Milwaukee, and it's likely that the the best way to find a first baseman of the future is to move Mat Gamel over from third, that is if he doesn't get traded. In Milwaukee's farm system there are guys that could be solid players, but none that look like future stars. Let's just hope the Brewers can hang on to Prince.